I am not sure what it is about Spaceship Earth, but I really enjoy taking photos of the attraction. Maybe it is the curve of the geodesic sphere, the texture of the triangles or the monorail circles around it as it arrives at EPCOT. Like most things in Disney it is amazing how different Spaceship Earth looks during the day versus the night. 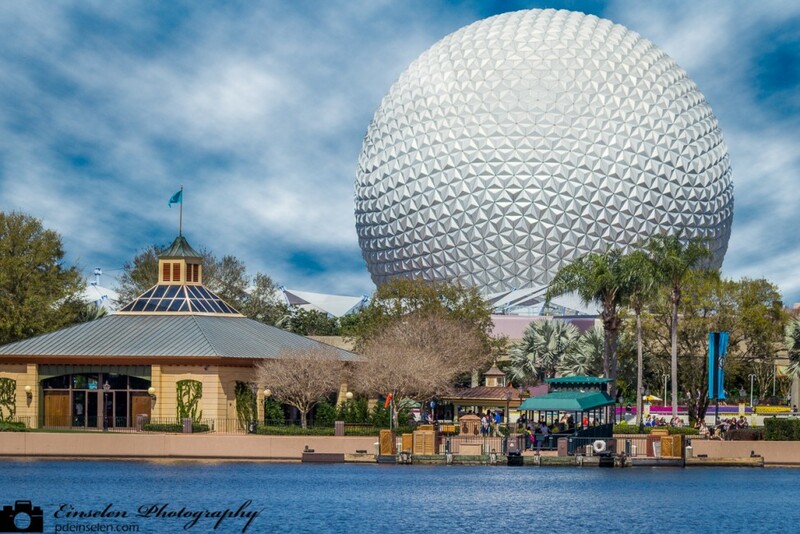 This photo is of Spaceship Earth taken across the World Showcase Lagoon. It is amazing that the fireworks barges brought out in a mere few hours to the middle of the lagoon to present “IllumiNations: Reflections of Earth”. The show uses fireworks, pyrotechnics, laser lights, fountains, and fire to create a visual production on the park’s World Showcase Lagoon. It was a beautiful clear sky, but that was a problem, it was too clear, not a single cloud in the sky. I took this opportunity to add the cloud effect in post production in Photoshop.